Clinique Take The Day Off Make Up Remover - I don't like using a normal cleanser or eye make-up remover pads as all that stretching of the skin encourages wrinkles. I love this from Clinique as you needed the smallest amount to get the job done and it leaves my lashes and lids squeaky clean. 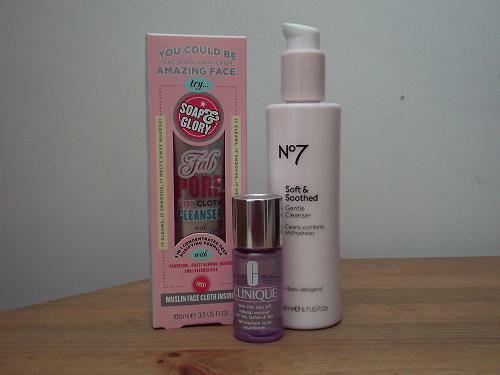 No7 Soft & Soothed Gentle Cleanser - I've been using this cleanser for as long as I can remember and I absolutely love it. It leaves your skin unbelievably soft and keeps dry patches at bay while working as a bonus way to remove dirt and oil from the day. Soap & Glory Fab Pore Hot Cloth Cleanser - I'm obsessed with hot cloth cleansers! 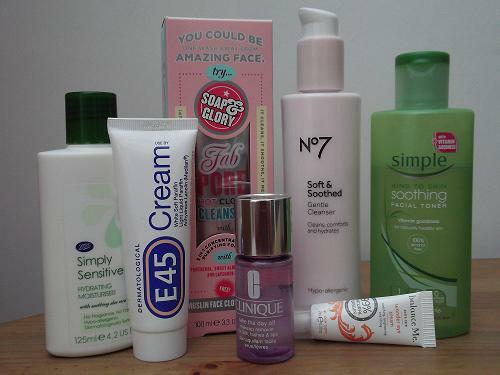 I've tried everything from Liz Earle's Cleanse and Polish to Superdrug's Vitamin E one and they are great. I love this one from Soap & Glory (obviously) as not only does it smell amazing but the cloth cleans and exfoliates hard to reach areas. 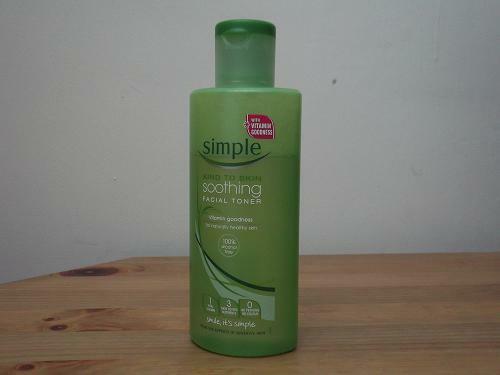 Simple Kind To Skin Soothing Toner - I found out that Lucy Mecklenburgh from TOWIE uses this toner so I was straight out to buy it and I'm loving it. It's 100% natural ingredients and removes any excess oil or make-up with ease with being dehydrating and leaving your skin tight. Boots Simply Sensitive Hydrating Moisturiser - I recently found myself back in the love hate relationship I have with this moisturiser! It's so thick and creamy and really works into areas that lack hydration but it does start to feel uncomfortable after a while. 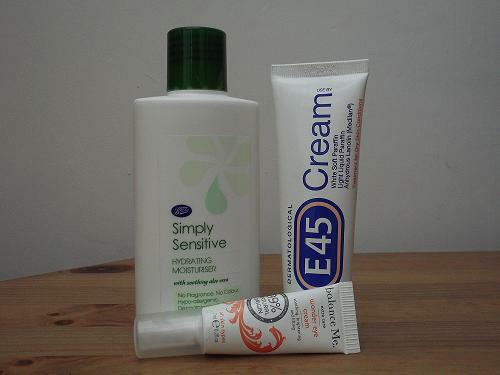 E45 Cream - I use this stuff on dry patches I have on my cheeks and my chin and it is a product that works absolute wonders. It clears up dry areas overnight and is an absolute godsend. Balance Me Wonder Eye Cream - I recently reviewed this product in full (read it here) and it leaves my eyes look alot more awake in the morning. I've also noticed a small improvement with the dark circles under my eyes so I'm not so much of a slave to my Collection 2000 Lasting Perfection concealer! Phew. So that's part two of my skincare routine. It looks alot but skin repairs itself overnight so it's just right to give it a bit of a boost. 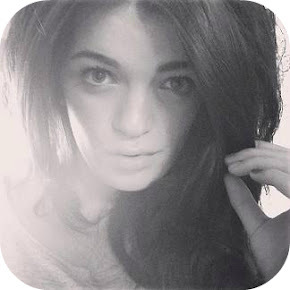 I'm planning to post a part three to this too, to show you all treatments I use! Do you have a skincare regime before you go to bed?